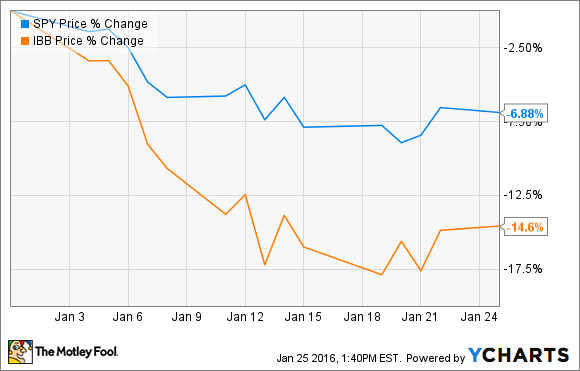 2016 has been rough so far on biotech -- but owners of these three stocks need not worry. The New Year's hangover the S&P 500 is still suffering hit the iShares Nasdaq Biotechnology index twice as hard, but long-term minded investors should be ready to party. Three of the biotech index's larger components, Biogen (NASDAQ:BIIB), Celgene (NASDAQ:CELG), and Gilead Sciences (NASDAQ:GILD) are poised for growth in the years ahead. And, fortunately for us bargain hunters, the market hasn't seemed to notice. Perhaps the most understandably overlooked of the big biotechs is Biogen. Last summer its lead growth driver, Tecfidera, was associated with cases of PML, a rare but deadly brain infection. This isn't the first time a multiple sclerosis drug has been linked with such infections, but Tecfidera's main appeal was its combination of efficacy and safety. While sales of the drug probably slowed further following the latest reported case of PML in November, the company is still expected to report double digit earnings growth this year and next. While Tecfidera's growth may be somewhat muted going forward, it's Biogen's late stage pipeline that puts it on my list of best biotech stocks today. Perhaps the most promising Alzheimer's candidate from any company to date, Biogen's aducanumab, began phase 3 trials involving 2,700 patients last September. Mixed data from a small trial dimmed expectations, and overall the company is trading at a shockingly low price of about 14 times forward earnings. If the larger aducanumab trials throw off encouraging data, Biogen shares should skyrocket. If they don't however, it's nerve damage-repairing anti-LINGO program also offers promise. As average life-spans in developed nations grow, demand for neurodegeneration remedies will rise as well. Perhaps no other biotech is better positioned to ride this trend. A bit of icing on the cake is the recent approval to market Benepali throughout the European Union. This biosimilar version of Amgen's megablockbuster Enbrel could very well pass the $1 billion mark despite its "generic" status. Oncology heavyweight Celgene relies heavily on blockbuster multiple myeloma drug Revlimid for growth. A recent patent litigation settlement should allow the drug to continue driving growth well into the next decade. While the company's masterful execution with existing drugs makes it a top biotech on its own, its dealmaking prowess truly sets it apart. Last summer the company made a hefty investment in Juno Therapeutics, a clinical stage leader in CAR-T technology. This potentially transformative way of treating cancers could eventually eat away at Celgene's share of the oncology market. Rather than attempting to duplicate Juno's success in its own laboratories, it has gone on the offensive. Leapfrogging its way into the CAR-T arena, Celgene made a $1 billion investment that includes rights to candidates directed at two promising targets, about 9% (and the potential for up to 30%) of Juno's shares, and a seat on its board of directors. It seems a potential rival just became a partner. This is hardly the first deal of this nature that Celgene has inked. The company has dozens of collaborations that, along with organic growth of its own products, should keep investors happy for many years to come. 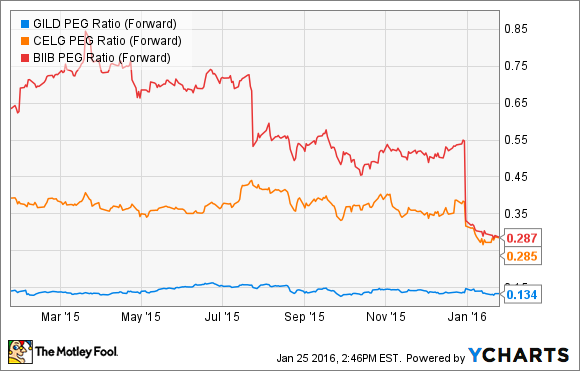 If I had to pick just one biotech, it would have to be antiviral champ Gilead Sciences. The company's share price has been at something of a standstill, while its profits have been soaring. When the company last reported, sales its Hepatitis C franchise were selling at an annualized rate of more than $19 billion. Much of the muted response to the company's success is due to fear that another recently-approved hepatitis C treatment from Merck & Co could eat into its share of the market. Last year, a similar fear of competition from AbbVie's Viekira Pak turned out to be overblown. Since then Gilead's combination Harvoni has continued to impress the medical community with an outstanding combination of efficacy and safety. By the time Merck's combination reaches pharmacy shelves, it will find Gilead's HCV franchise further entrenched than AbbVie did with Viekira Pak. To top it all off, Gilead could win approval in June for a pan-genotypic pill that will eliminate the need for costly genotyping of patients before beginning treatment. Despite these advantages, the market doesn't seem impressed. At less than 7 times forward earnings, even if Gilead profits remained flat for several years, shares at recent prices would still provide a solid return to investors through a recently announced dividend and $15 billion share repurchase program. I don't expect this to be the case as a recent Senate Finance Committee report indicated less than 2.4% of roughly 700,000 Medicaid enrollees with Hepatitis C were treated with Sovaldi in 2014 due to access restrictions. The number of patients untreated at present is unclear, but I'd say Gilead's HCV franchise still has plenty of room to run. Measured as the forward P/E Ratio divided by the expected earnings-per-share growth percentage during the period, investors generally consider anything under 2.0 a good deal. While election season rhetoric might depress biotech in the near term, I'm confident that investors braced for the long haul will be happy they started the year off right with these three beauties.